I don’t know about you, but I’m the kinda person who loves to look through cookbooks and recipe magazines. It’s so restful and inspiring to me. Recently I subscribed to some digital recipe magazines to read on our iPad and it’s been so fun to have a new “cookbook” to look through every month. Also, the family whose house we’re subleasing left behind some cookbooks and I’m pretty sure I read through them in a couple days. Their daughter needs to eat a gluten free diet, so most of the cookbooks contain fully gluten free recipes. Yet, even though I’m not gluten free, I got so much recipe inspiration from the books and have a new list of want-to-tweak recipes that will hopefully make the cut and be posted on the blog in the coming weeks. 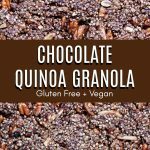 While reading through one of the cookbooks, a recipe for quinoa granola quickly caught my eye and, considering I’m a chocoholic, I decided to try out a chocolate version. It took a few attempts, but I am so happy with the final result. I don’t know about you, but I’m all about crunchy clusters in my granola and this recipe is full of huge, crispy clusters that you can break into smaller pieces or keep whole. 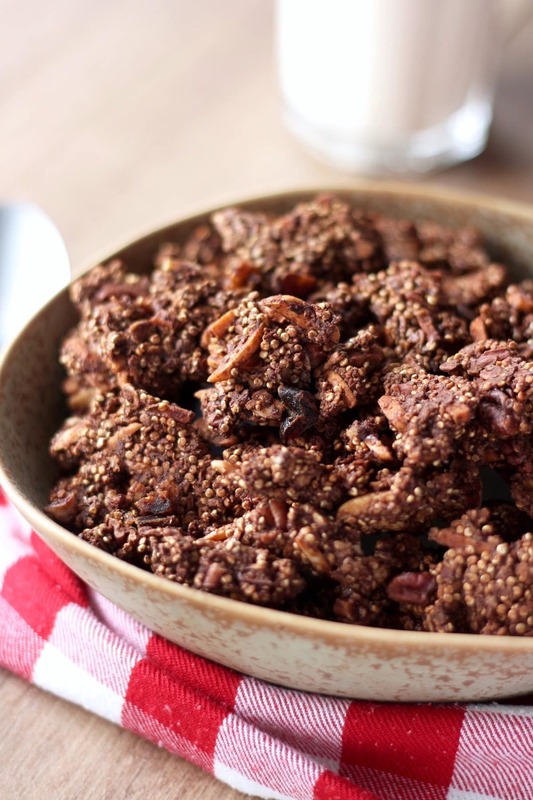 With the quinoa, slivered almonds and chewy dried fruit, there is so much amazing texture going on as well. Then with rich cocoa powder and sweet mini chocolate chips laced throughout, you’ll be in chocolate heaven after just one bite! 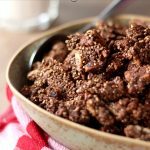 This chocolate quinoa granola tastes amazing straight from the Tupperware, paired with my coconut yogurt or simply eaten with creamy, cold almond milk. It makes for a delicious breakfast or, when eaten by the handful, a fun, sweet snack on the go! 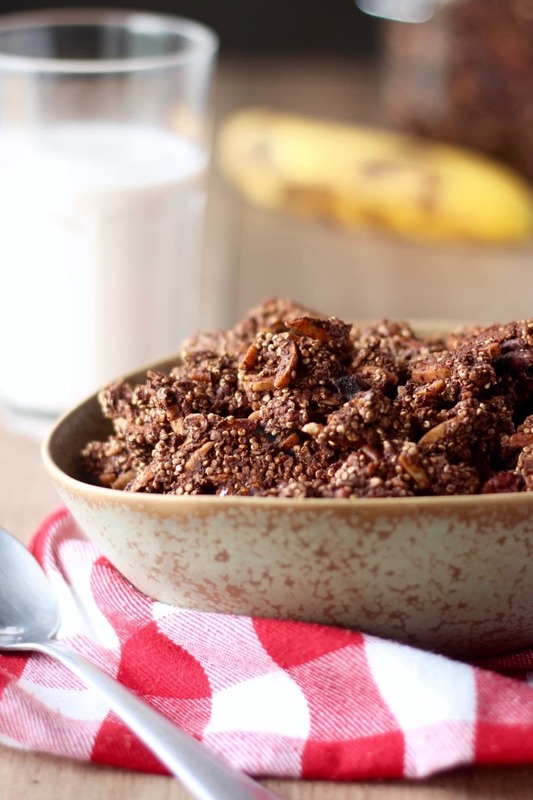 If you give this delicious chocolate quinoa granola a try, please let me know in the comments below what you think! Be sure to rate the recipe and share it with others as well. More amazing granola and granola bar recipes! 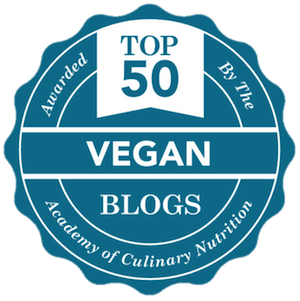 In case chocolate isn’t your thing, be sure to check out the other amazing granola and granola bar recipes I’ve previously posted on the blog. I’m sure you’ll find something that gets you excited to get out of bed in the mornings! 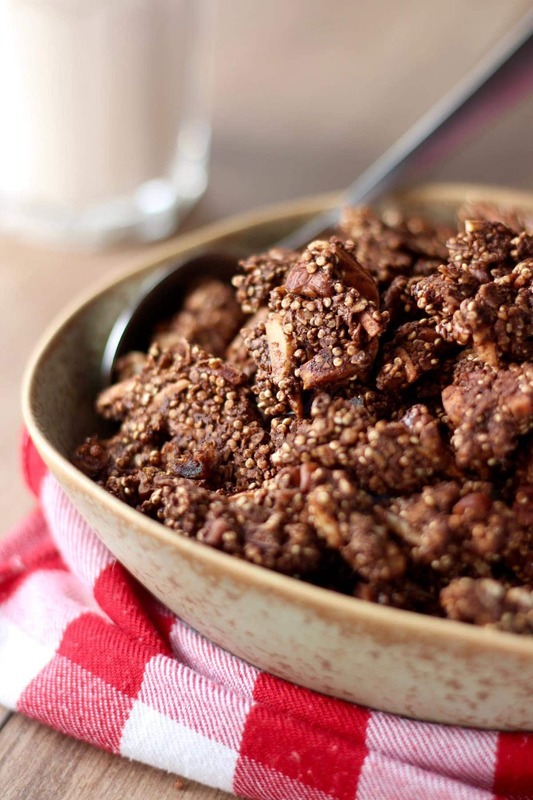 Packed with protein-rich quinoa and sweetened with maple syrup, this Chocolate Quinoa Cluster Granola will have you jumping out of bed in the mornings! Preheat your oven to 325F and line a baking tray with a silicone baking mat or parchment paper. Set aside. In a large mixing bowl, stir together all of the dry ingredients, from the quick oats to the sugar. In a smaller bowl, whisk together the liquid coconut oil and maple syrup until combined. Pour the wet ingredients over the dry ingredients and stir until all the dry mixture has been coated with the oil and maple syrup. Pour the granola onto your prepared baking tray and, using damp hands, press the mixture into a flat, even, thin layer. 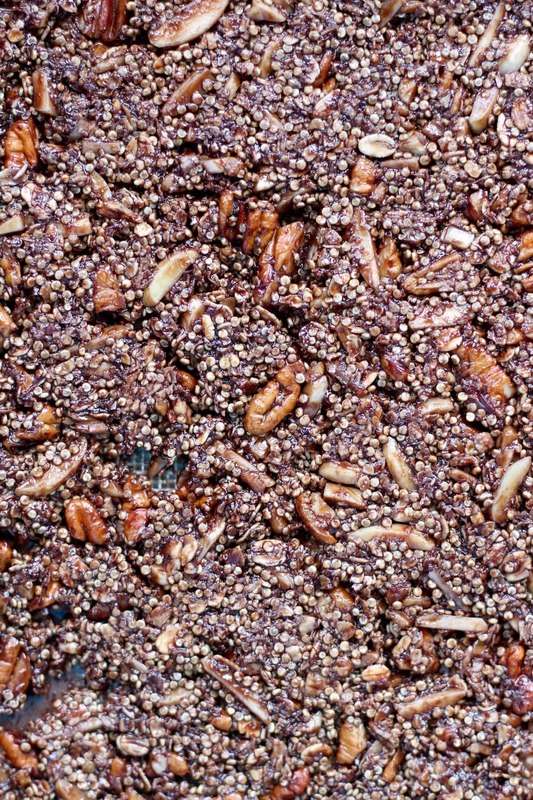 Bake the granola for 20 minutes. Removed the granola from the oven and use a spatula to flip the granola over in sections. Return the granola back to the oven and bake for another 13-18 more minutes, watching carefully towards the end to ensure it doesn't burn. Remove the granola from the oven and sprinkle the mini chocolate chips and dried fruit evenly overtop. 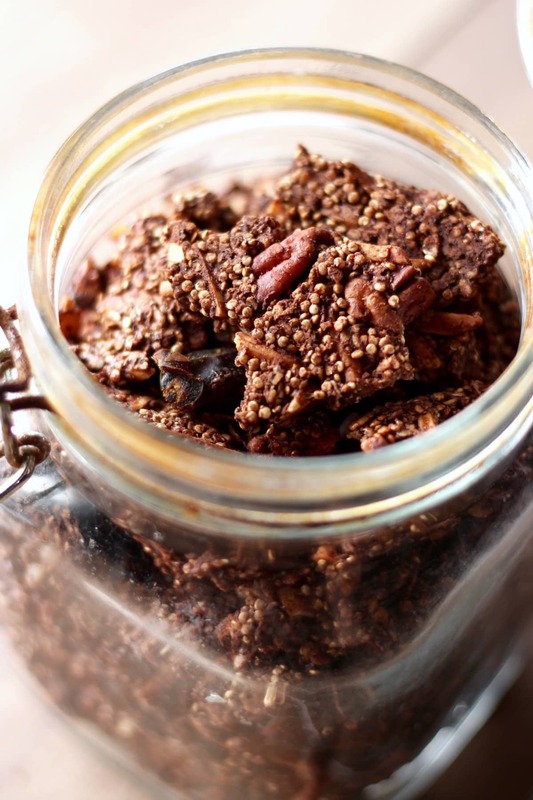 Allow the granola to cool and harden completely before breaking it into pieces and storing it in an airtight container. *If you want a less-sweet or refined sugar free granola, feel free to omit the extra sugar. No worries!! 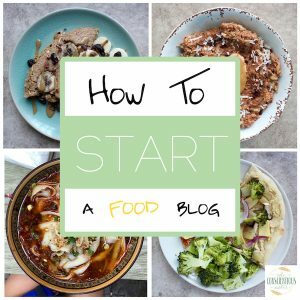 Thank you for making my recipes! This is delicious. Thanks for the recipe. I’m so glad you enjoyed it Sue! I’ve been having some everyday:) If you have time to leave a star rating, I’d really appreciate it! And I believe it! It doesn’t last long in our house either! !